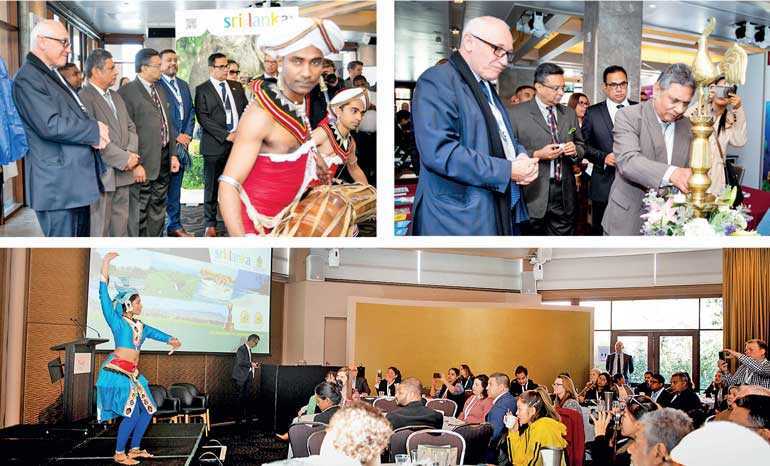 The Sri Lanka Tourism Promotion Bureau (SLTPB), in collaboration with the Consulate General of Sri Lanka in Sydney, organised Sri Lanka’s participation at the Travel Industry Exhibition held on 21 and 22 August at Dockside, Darling Harbour in Sydney. Sri Lanka was the destination partner at this annual event, and a 14-member Sri Lankan travel trade and SLTPB official delegation showcased the unparalleled diversity of the nation and the newest travel experiences at the exhibition. On the first day of the exhibition, a press briefing with a Sri Lankan breakfast was organised at the Dockside Cold Room and more than 40 media personnel and travel trade members attended the networking meeting. NSW State Parliament MP Damien Tudehope, Foreign Affairs and Trade Department Director Rhonda Piggott, Consul General for Sri Lanka in Sydney Lal Wickrematunge, SLTPB Managing Director Sutheash Balasubramaniam, and SriLankan Airlines, Melbourne, Country Manager Sanjeewa Jayathilake spoke at the press briefing. Sutheash Balasubramaniam made a presentation highlighting the major tourist attractions of the country, and a promotional video was screened. He said that Sri Lanka has a rich artistic tradition, with distinct creative forms that encompass music, dance and arts. He further said that the culturally rich island is home to a number of different religions, bringing with them their own traditions, festivals and parades, making Sri Lanka a hotspot for tourists and locals alike. He added that Buddhist, Hindu and Muslim celebrations bring a unique flavour of dance, costume and music. A peacock dance item was presented to the audience at the press briefing. Sri Lankan delicacies, including hoppers and Ceylon tea, were served at the breakfast networking. Sri Lanka is one of the fastest growing outbound leisure destinations for Australia, the country is now accessible via non-stop SriLankan Airline flights direct from Melbourne to Colombo. The Australian guests and the media personnel joined the official opening of the Sri Lankan pavilion while the Sri Lankan dance group performed traditional cultural items. The Sri Lanka Consulate General had also arranged meetings with Council of Australian Tour Operators (CATO), the Australian Federation of Travel Agents (AFTA), Fairfax Media, Helloworld Group and Unique Tourism for the visiting tourism officials from the SLTPB. Sri Lanka’s participation at the travel Industry show was coordinated by Consul (Commercial) of Sri Lanka in Sydney Consulate General Abdul Raheem and Sri Lanka Tourism Promotion Bureau Assistant Director Chami Gasnawage.